This Moonshine Spout eliminates spillage and waste, and makes it easy to pour your 'shine! 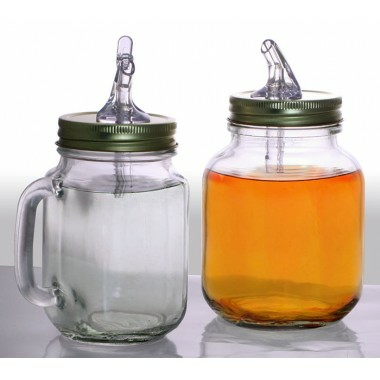 Comes completely assembled with the lid and spout (mason jar not included). 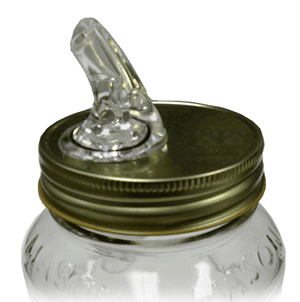 Fliptops: For an additional 50� you can add fliptops to the Moonshine spout. Fliptops help keep insects, smoke, dust and debris out of the mason jars. If you already have Posi-Pours Portion Spouts or Hard Plastic Free-Pour Spouts and are having issues with pesky fruit flies, smoke, dust or debris getting into your expensive liquor bottles, than adding a fliptop will solve your problem.